Note: This article explains web databases – a kind of database introduced in Access 2010. It doesn’t explain Access web apps which use SQL Server to store data, and offer numerous other improvements over web databases. For more information, see the article Create an Access app. Important: Although you can open a web database, publish it, edit it, and sync your changes, you can’t create new web databases using this version of Access. Access Services (an optional component of SharePoint) provides a platform for you to create databases that you can use on the Web. You design and publish a web database by using Access and SharePoint, and people who have SharePoint accounts use the web database in a web browser. 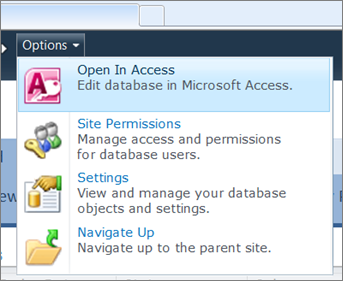 When you publish a web database, Access Services creates a SharePoint site that contains the database. All of the database objects and data move to SharePoint lists in that site. After you publish, SharePoint visitors can use your database, based on their permissions for the SharePoint site. You can open the web database in Access, revise the design, and then sync your changes — effectively, save them to the SharePoint site. You can also take your web database offline, use the offline version, and then sync data and design changes when you are back online. Note: To build a web database, you need Full Control permissions on the SharePoint site where you want to publish it. All SQL processing for web objects happens on the server. This helps improve network performance by limiting traffic to result sets. Note: If your web database has “client” objects – queries, forms, reports, etc. that can’t be used in a browser – any SQL used by those objects is processed by Access on your desktop. You can publish to your own intranet SharePoint server, or to the Internet. Microsoft is offering an Internet-facing, hosted SharePoint solution, and third parties also offer hosting services. This section provides steps for the basic design tasks you can do in a web database. Some database features that you can use in a desktop database are not available in a web database. However, there are new features that support many of the same scenarios as these desktop features. Note: You can create client objects in a web database, but you cannot use them in a browser. However, they are part of the web database and can be used in Access on the desktop. People can open the web database in Access, and then use the client objects. This is an effective way to share a database, and also opens new opportunities for working together over the Web. SharePoint handles any concurrency issues. The following list is not exclusive. There are two ways you can open a web database: from a browser, or from Access. To open from a browser Browse to the web database site, and at the upper left corner of the main navigation form (just below the browser toolbar area) click Options, and then click Open in Access. To open from Access Open the file like you would open any database file – press Ctrl + O and use the Open dialog box. With your web database open in Access, on the ribbon, click Create, and then in the Tables group click Table. Or, on the table datasheet, click Click to Add, and then select a field type. Use the Expression Builder to create the calculation for the field. Remember that you can only use other fields from the same table as data sources for the calculation. For Help using the Expression Builder, see the article Build an expression. Use the Expression Builder to create your validation rule. For Help using the Expression Builder, see the article Build an expression. Table relationships are the way you indicate that two tables have data in common – that one of them uses data from the other, and perhaps also vice-versa. Say, for example, that every Task has a responsible Employee, and this fact is represented in the Tasks table by the EmployeeID field – the primary key of the Employee table. When you look at data about a task, you can include data about the responsible employee by looking it up in the Employees table using the EmployeeID – or rather, Access does it for you. Open the table that should be on the many- side of the relationship – the one with multiple records per key value. You can implement cascade updates and deletes by using data macros. You can use commands on the Table tab to create embedded macros that modify data. This procedure uses the charitable contributions template as an example. You can follow along if you create a new database by using the charitable contributions database template. You might want to wait until last to create your Navigation form, so that that you can add all your objects to the form when you create it. You do not have to select your navigation form as the web display form. You can specify any web form. If any issues are discovered, Access stores them in a table called Web Compatibility Issues. Each row in the table contains a link to troubleshooting information.